With Alberta's capital now surrounded by "agricultural disaster" areas, the province's agriculture minister said Tuesday what farmers have been saying for weeks. 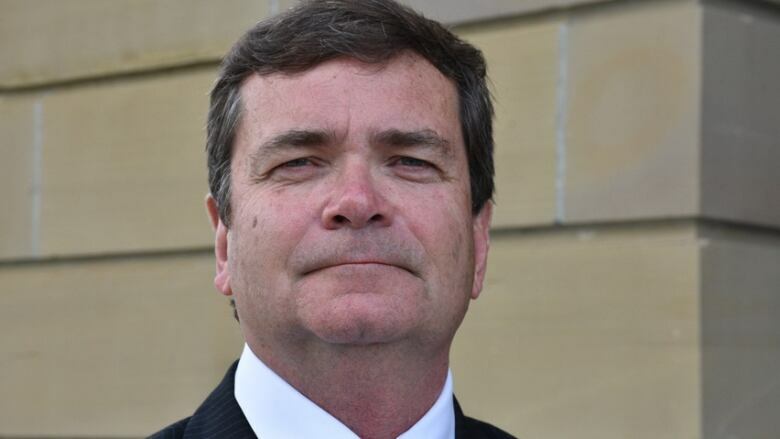 There is a drought in Alberta, said Minister of Agriculture, Forestry and Rural Development Oneil Carlier, and it so far seems as bad or worse than similar ones that hit the province in 2002 and 2009. "Drought, to me, means abnormal dry condition, and that's what we have," Carlier, a former Agriculture Canada employee who lives in the small town Darwell, told CBC News on the steps of the provincial legislature. "So I've got no concerns calling it a drought. At least, in parts of Alberta." Officials have, until recently, seemed reluctant to call the situation a drought. Leduc County, on Edmonton's southern border, on Tuesday became the fourth Alberta county in two weeks to declare a state "agricultural disaster." County Mayor John Whaley was as plain-spoken as the farmers and ranchers who elected him. "There is a disaster happening here in this part of the world, where a lot of the food is produced, and we need to draw attention to that," Whaley said. "We don't do this lightly. But we're the government closest to the people. So we hear this from our neighbours and our friends on a daily basis. So, we've been forced to act." By declaring a disaster, Whaley and other county officials hope to convince other levels of government to step in with financial help. Whaley wants the provincial or federal governments to offer farmers tax deferrals, if they're forced to sell their cattle herds, and loans to buy feed for cattle they manage to keep. Carlier said the province's Agriculture Financial Services Corporation has several current programs designed to help farmers and ranchers through difficult times. Producers have access to crop insurance, farm loans and other risk management programs such as AgriStability and AgriInvest. "At this point, the vast majority of farmers are protected with their insurance programs," Carlier said. "The first line of defence is their insurance. It's very well subscribed in Alberta. Knowing that, farms don't want insurance, they want a crop." Sturgeon County on the northern outskirts of Edmonton declared a "state of agricultural disaster" on Monday. Whaley said drought conditions seem to hit the province in seven-year cycles. His county also declared disasters in 2002 and 2009. "We've had next to no rain since the snowmelt," he said. In an area where round bales of hay sold for $50 last year, one Leduc farmer said she is now forced to pay $150 for the same amount. Carlier encouraged farmers to register for existing assistance programs. "Farmers are a resilient bunch," he said. "This is drought, and we will get through it."